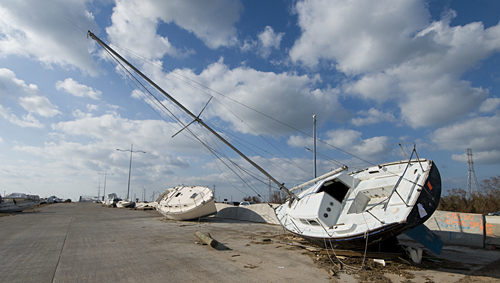 Remnants of Hurricane Ike a week after it hit Galveston, Texas. Although we have had some fantastic, almost mesmerizing, rain this week … all good things must come to an end. The rains that drenched Denton were just that – slow drenching rain that didn’t make much of a difference in runoff that ends at local lakes. Mostly, it just soaked in. Behind the scenes, off the record, on the QT, folks who don’t remember better talk about a “little” hurricane to bring relief to their parts of Texas. Having been through a few of these, I can say with experience; A hurricane really isn’t something you wish for – for yourself or anyone else. We will just have to take our lumps, and hope we have slipped into a more forgiving weather pattern. And we will have to hope that some of this water reaches the Texas Gulf Coast before it gets swallowed by our bulging population. In all likelihood, Mother Nature isn’t close to done with us yet. Sand bass are moving in quite close off the points on Lake Ray Roberts, and you can even get shots at carp in the rain if you want to test that theory. Conventional fishing will fill your cooler right now, if you like the idea of sand bass tacos. Otherwise, you can take a kayak out (they’re just a bit too far offshore), and catch all you want on fly – and release of course!